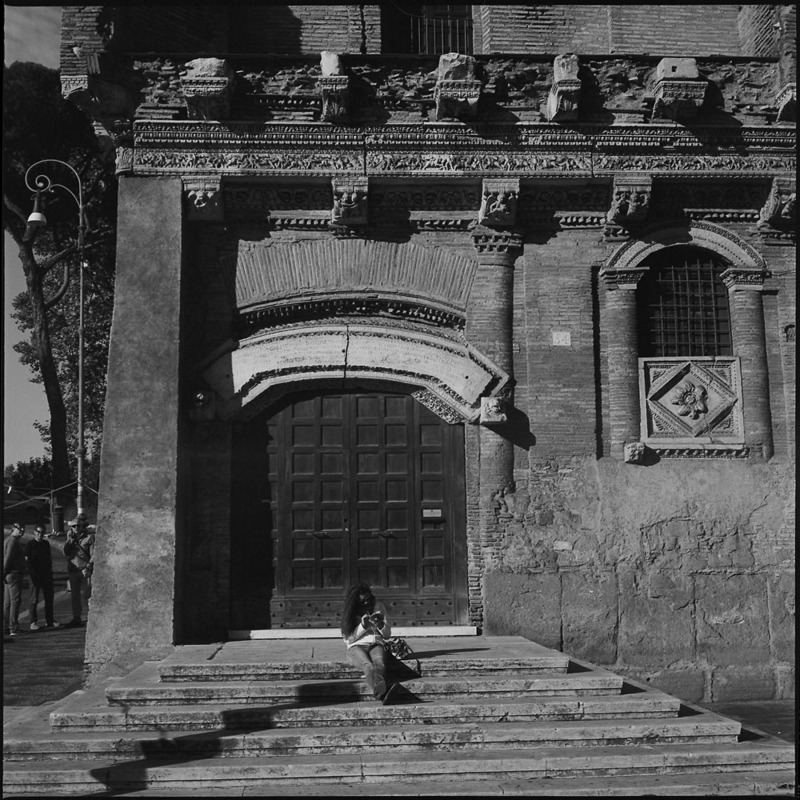 In a previous post I mentioned the Temple of Hercules Victor and the Fountain of the Tritons on the Piazza Bocca Della Verita, and the associated temple and church of the Temple of Portuno and the Basilica of Santa Maria in Cosmedin. Here they are. 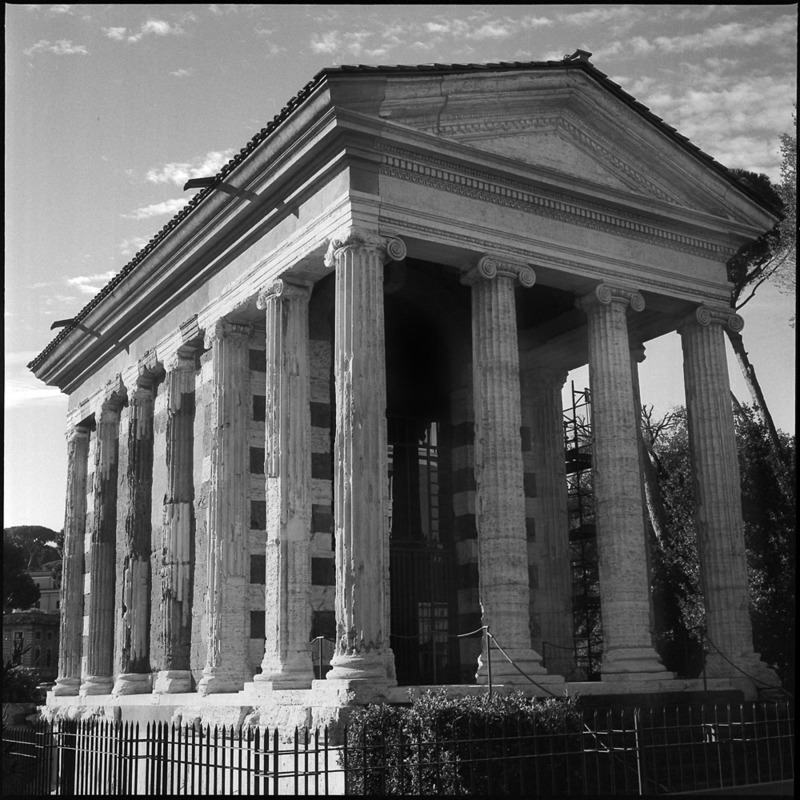 The Temple of Portuno is more or less contemporary to, although somewhat newer than, the Temple of Hercules Victor. It survived into the Christian era and was re-purposed as a Christian church, to later fall into disuse. It has been stabilized and restoration work is ongoing. The library of the Casa Dei Crescenzi sits immediately across the street from the Temple of Portuno. The structure in this shot is early medieval/Romanesque in design. I saw the girl sitting on the steps, waiting for the library to open, or perhaps waiting for a bus. From the camera’s perspective, the men around the corner appear to be looking at her and commenting, although in all probability it was me and my camera that piqued their interest, since from their position they would not have actually been able to see the girl. 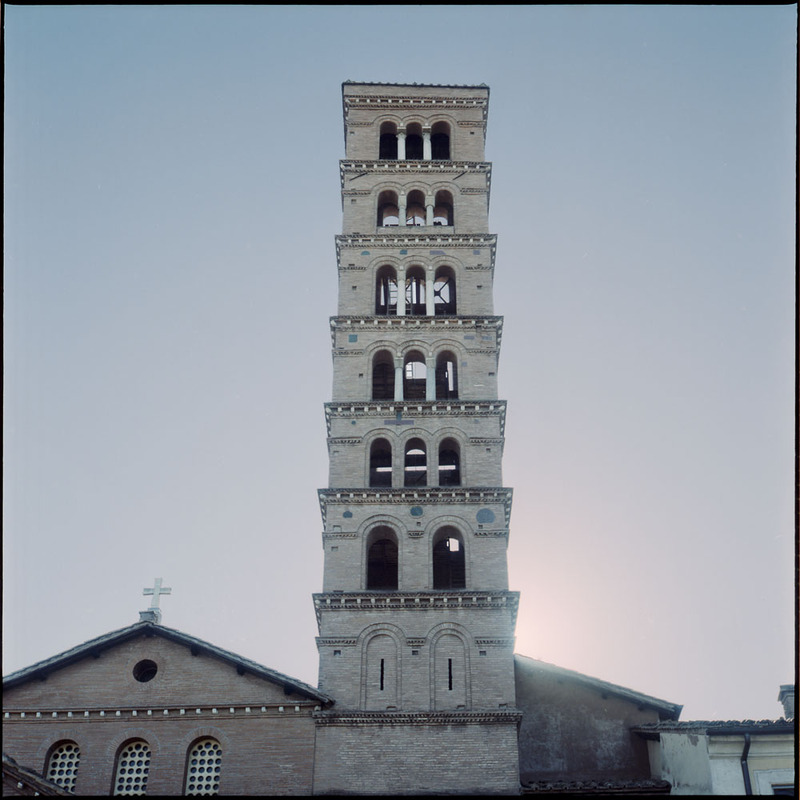 This is the Romanesque bell-tower of Santa Maria in Cosmedin, one of the older Christian churches in Rome, home to the Bocca Della Verita which now resides on the front porch, the easier to access for tourists. Saint Valentine’s relics also are kept here. I thought it was particularly striking with the sunlight just cresting the roof of the church and backlighting the tower. Contrast this with my earlier shot of the Campanile in Florence. I’m particularly pleased at how well my camera handled the backlighting without flare or loss of resolution. It did a remarkable job for a 60-year old lens. And maybe it’s also a sign that I’m becoming a better photographer such that I composed it to minimize problems.